Something To Do With Death – that’s the title of Sir Christopher Frayling’s biography of the great Spaghetti Western director Sergio Leone. And you can’t argue with that. Leone’s postmodern spins on the western were all about death – operatic, vengeful, and at times comical. Developed by Grand Theft Auto designers Rockstar Games, Red Dead Redemption draws heavily on the legacy of Sergio Leone. Red Dead Redemption is about America, of course (it’s a western after all). 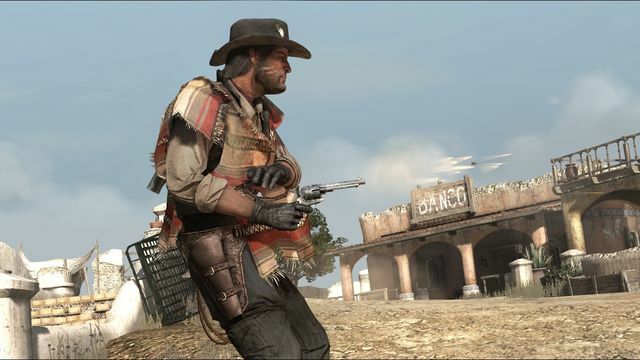 The 2010 action game tells the story of reformed gunslinger John Marston, whose wife and son are held hostage by government agents. In return for hunting down his old gang members, the Bureau of Investigation will free his family. To the Rockstar gods we asked, “What would Grand Theft Auto look like if it was set in the Old West?” – and they answered. 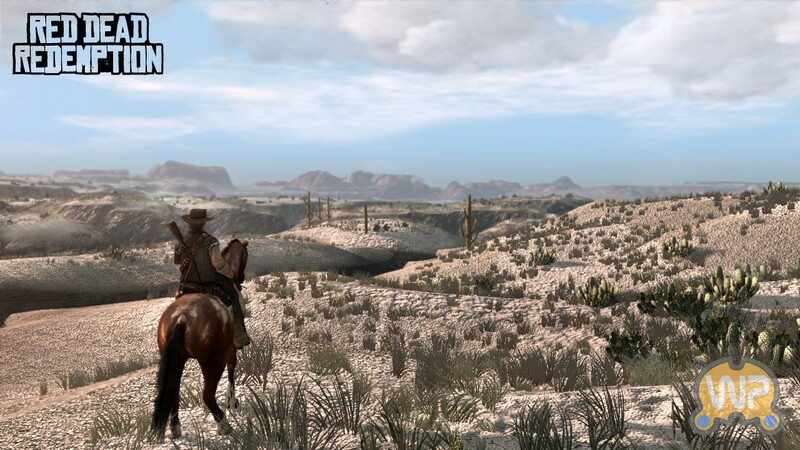 From a design standpoint, Red Dead Redemption features all the exploring, collecting, racing, shooting, and side questing we’ve come to expect from these open world adventures. And in atmosphere and aesthetic, Red Dead Redemption pays tribute to Sergio Leone. You don’t have to work hard to find the Sergio Leone influences. Look at John Marston in his poncho and you see the outline of Clint Eastwood’s Man with No Name. Dig deeper and you find the ubiquitous themes of worlds colliding – civilization encroaching on the old ways of revenge – that run throughout those movies, especially Once Upon a Time in the West. As in that epic movie, Marston is driven by family. And the Mexican Revolution setting of Leone’s last western, Duck, You Sucker! (aka A Fistful of Dynamite), is also reflected in Red Dead Redemption’s sardonic take on revolutionary heroes and villains in the Mexico levels. Rockstar reveres the classic western too. Like John Wayne’s Ethan in The Searchers, John Marston is an antihero seeking to save captured family members. Also: as with The Searchers, Red Dead Redemption plays out as an extended chase across the Old West. Other thematic influences are taken from Shane (can a man of violence “break the mold”?) and Unforgiven (can an old gunfighter find absolution through justified killing?). I went back and listened to music from the period, and while there’s “Jimmy Crack Corn,” that’s basically it. We’re talking pre-showtunes. There was no “Western sound,” but ’60s psych has become the “Western sound.” If you listen to Spaghetti Westerns, none of that music was authentic to the period. All drumming and tolling bells, in keeping with the game’s theme this track is at once dramatic and mournful. It follows John Marston and weaves its way through pacier action cues. Like all great scores, this complements the story. As with Ennio Morricone’s classic scores for A Fistful of Dollars, For a Few Dollars More, and The Good, the Bad and the Ugly, this track strikes you with its use of whistling. The Red Dead musicians make “Born Unto Trouble” all their own though – with its lonely whistles and sad notes on piano and fiddle, this truly defines John Marston. Guitars and drums and bass and horns – we’re far from Morricone on this one! Red Dead Redemption’s visceral gunfights are standouts, and this modern track sets the pace. “Triggernometry” just works. At another level, you can hear echoes of the discordant guitar that was the theme for Frank, Henry Fonda’s bad guy from Once Upon a Time in the West. The first half of “The Outlaw’s Return” reflects the tense build-up and jarring bursts of violence that defined Sergio Leone’s westerns. But Bill Elm and Woody Jackson do their own thing here, using simple guitar notes and furious strings to escalate the drama. Sergio Leone used long, stylized takes, framing his version of the Old West (and old westerns). See the opening sequence of Once Upon a Time in the West, a dialog-free landscape of gunmen waiting at a train station in the desert. An old windmill creaks; a gunman swats at a fly; another collects water in his hat. Everything Leone did with that scene is utterly mesmerizing. You hear elements of “Muertos Rojos (The Gunslinger’s Lament)” when riding through Red Dead Redemption’s desert trails. Intentional programming on Rockstar’s part I’m sure, as these notes seem to kick in during the sections in Mexico, especially at night. The intense shootouts in canyons or broken down forts define the game’s action. But Red Dead Redemption really comes alive in its open world. And like most open world games, the best parts are the grace notes, the notes between the notes, the moments between the missions. The sections where you ride off the beaten path into the frontier, the wilderness of the west, where you encounter bandits holding up wagons, or wolves howling in the night. As an explore-’em-up, Red Dead Redemption captures the unpredictable nature of the Old West. The quiet notes of “Muertos Rojos” are used perfectly throughout. Lonely, haunting, atmospheric, the ambient music deepens the player’s immersion. No mention of the songs? Praise gets heaped on Rockstar for incorporating “Far Away” by Jose Gonzalez, and the closing sequences that feature equally superb music. Powerful as it is, the use of “Far Away” took me out of the game. Following directly after a desperate shootout on a river crossing to Mexico, the music doesn’t give the player time to recover and get your bearings in a new landscape. As a cinematic touch, “Far Away” was wonderful, but the gameplay should speak for itself. The score to Red Dead Redemption is not just shorthand for keying the audience into a western. Nor is the soundtrack a pastiche. Bill Elm and Woody Jackson evoke the Old West, as well as the groundbreaking music of the great Ennio Morricone, and give it all a modern touch. They brilliantly bind together guitars and accordions, trumpets and flutes, the lonely toll of a bell, the harmonica, and even an ocarina (making Red Dead Redemption the second greatest game to feature the clay wind instrument). Worth buying in its own right, Bill Elm and Woody Jackson’s score references the Spaghetti Western while bolstering the game’s theme of redemption. Haha, thanks! Life, work, school got in the way there – but I’m hoping to spend a bit more time in the WordPress games blogging community! I hear ya! Those get in the way a lot, haha. I hope we get to see more of you here. Great post! Like a museum exhibit for the music of such a great game. I always liked RDR’s music – it really set the mood for Marston’s character. Interesting to see the influences behind a great score. Thank you! Red Dead did such a great job drawing on classic and spaghetti westerns. As you say, the music defined the character of John Marston.